I never thought we would homeschool our children. I never would have imagined we would adopt a child. I will never say never again. Jay and I have entered the world of homeschooling. We began feeling a draw to this form of education, for several reasons, a little over a year ago, but at the same time not completely sure why. We discussed it several times with Jayne and Jared, and they each seemed noncommittal either way. Always stating it is our decision. As a child I had always wanted to be a cheerleader, but didn’t quite have what it took. As shallow as this may sound, I was having a hard time taking the possibility of a second year of cheerleading away from Jayne. I had no idea what my next obstacle would be. TENNIS!!! I played tennis all through junior high and high school with the exception of my junior year. Jayne and Jared both played tennis this past spring. Oh my goodness, did it make me question if we had made the right choice for these two. (For the first time, I realized, how exciting it is to have your kids be interested and have potential at a sport I played.) However great tennis is for kids, and it is, it was a temptation to get me off track for what we believed was what we were called to do with their education at this time. So by Faith, we decided to homeschool this year. In October of 2013, a sweet young lady, Madison Russ, gave us our first tour, with Jake, at Southwestern Oklahoma State University. We connected right away with her and the folks from the touring office. Jay had realized from her bio that she was from Maysville, which is 10 miles east of Lindsay. When she answered the phone and Jay said to her “Oh you’re the one who secretly likes Pretty Little Liars” she probably thought she had a stalker on her hands. He apparently had read her entire bio and knew her “something most people don’t know about her.” During our tour, Madison did some stalking of her own and found the Due Unto Others website. She and her husband Ryan are feeling the call to adoption. She was an elementary education major at the time. In March, there was a kNOw More Orphans Conference in Birmingham, Alabama. Through God’s Providence: Madison, Jayne, and I were able to go together. I remember Jay asking me why I felt so strongly about going? I told him, I really couldn’t give him a good answer except I knew strongly we were to go. Adoption (in the traditional sense) is not what we do with the medical mission work that we’ve been called to in Uganda. However, I believed strongly that Madison, Jayne, and I were to go. I didn’t realize until after we had left for Alabama that we would be gone during Cheerleading tryouts. Once I found this out as well as having an inkling that Jayne has a special place in her heart as I watch her with the orphans and children in Uganda, I knew God’s timing was perfect. (This trip after scheduled, ended up being tough, because the next morning my grandfather’s final living sibling was admitted to the hospital. I spent the next two days before we left with my 99 year old Great Uncle Jodie in the hospital. I had already planned his 100th birthday at our Ranch in September. He was as sharp as a tack mentally, and we had some good time and talks together. I fully expected to land in OKC on Sunday and go straight back to the hospital, but he went home to be with the Lord Saturday night before we returned.) God, was gracious and his timing was still perfect. Our family kept me posted every few hours and the Lord graciously ministered to my aching heart through His Word and the Worship Songs. 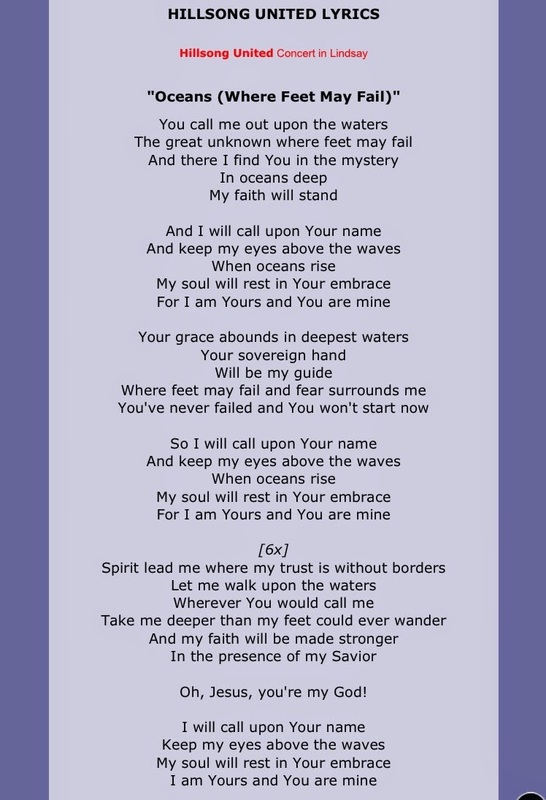 If you have never heard 10,000 Reasons, it’s worth a listen. Jake was asked to speak at his high school graduation on giving back. As he shared with his fellow students, parents, and others there, he shared Jamil’s story. So as soon as Jake’s graduation was over, we headed off for what we thought would be a 6 week medical mission trip back to Uganda. It was. However, Jay and I felt over the previous year back in the US that if Jamil’s tumor was back, we needed to do all we could to bring him to the US for some Western Medical Treatment. Our heart sank when the Ct Scan, in Uganda, showed the tumor had returned. So our six week trip turned into eight as Jay and I worked through the legal process of getting Jamil legally set up to travel with us. This definition as seen in some of our previous blogs occurred when a twelve year old Ugandan boy was granted a US tourist visa to come to the United States for treatment. The United States does not have a medical visa from Uganda. Miracle is also defined as a highly improbable or extraordinary event , development or accomplishment that brings very welcome consequences. As an amazing product or achievement, or an outstanding example of something. 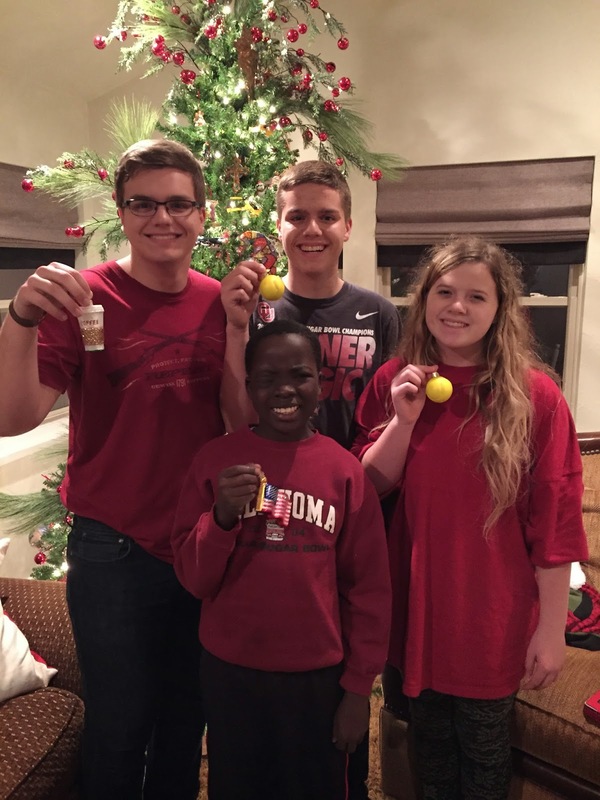 This definition is truly the point of this blog as the mom of a young Ugandan teenage boy seeing and experiencing Christmas in a very different culture for the first time, and the weight that responsibility I pick up and carry often. When we realized Jamil would need to be here for longer than the 6 month visa due to unforeseen health issues, we made a new game plan. He needs to be followed for his NF2 genetic condition closely. Of course, as the Lord would have it, the best clinic in the country for NF2 is at OU Children’s Hospital. 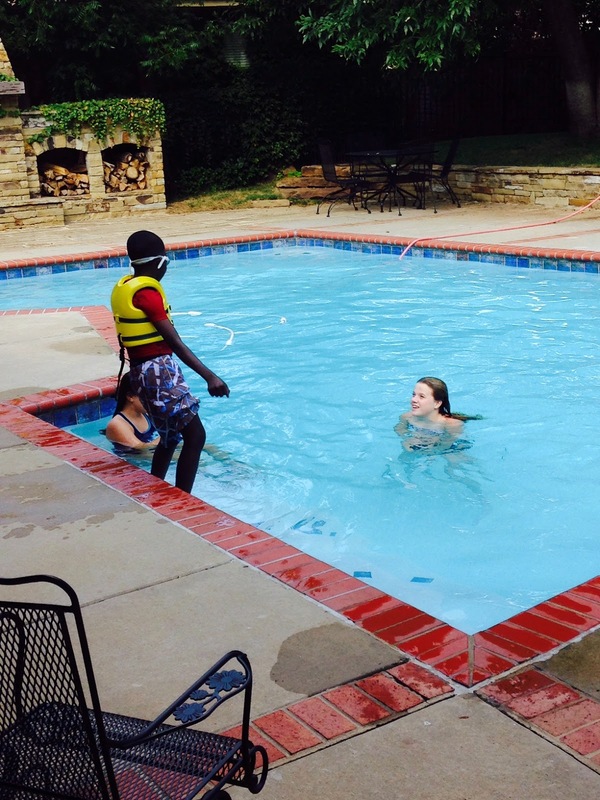 We may or may not need to officially adopt Jamil, but as I’ve said before, he has been adopted into our family! With or without a legal document at this time, he is our child. Never say never! My theme when Never say never gets tough, and it does: Besides Proverbs 3:5-6 being my life verse, “Trust in the Lord with all your heart, and do not lean on your own understanding. In all your ways acknowledge him, an he will make straight your paths.” I was reminded in a sermon Sunday, that I should continue into that chapter past verse 6. Verse 7-12 “Be not wise in your own eyes; fear the Lord, and turn from evil. It will be healing to your flesh and refreshment to your bones. Honor the Lord with your wealth and with the firstfruits of your produce; then your barns will be filled with plenty, and your vats will be bursting with wine. My son, do not despise the Lord’s discipline or be weary of his reproof, for the Lord reproves him whom he loves, as a father the son in whom he delights.” The Lord has also given me the song byHillsong United called “Oceans”. I will hear it a times I need it the most when things are bitter and when things are sweet. So many miraculous things, I have witnessed, big and small, as hopefully we have been able to describe to each of you in the blogs since we chose to follow the Lord’s call to Uganda. 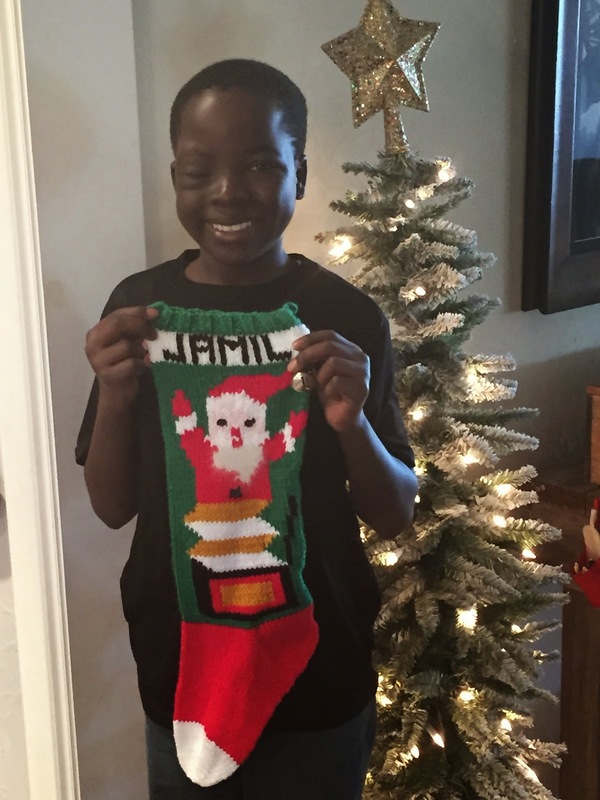 But, when you aren’t in control (which none of us truly ever are), this Mom felt a great need to take December to make sure Jamil understood what Christmas is really about. It is hard to believe Jake became the first child in our family 19 years ago on December 22nd . Since that time, I knew I could not teach him what I didn’t know about the Lord. So, I had no more excuses like being to busy working outside of the home to spend individual time with my Lord and Savior. The time had come for me to make my relationship the priority He deserves and actually calls us each to. I choose to learn what being a true Christ Follower is truly. 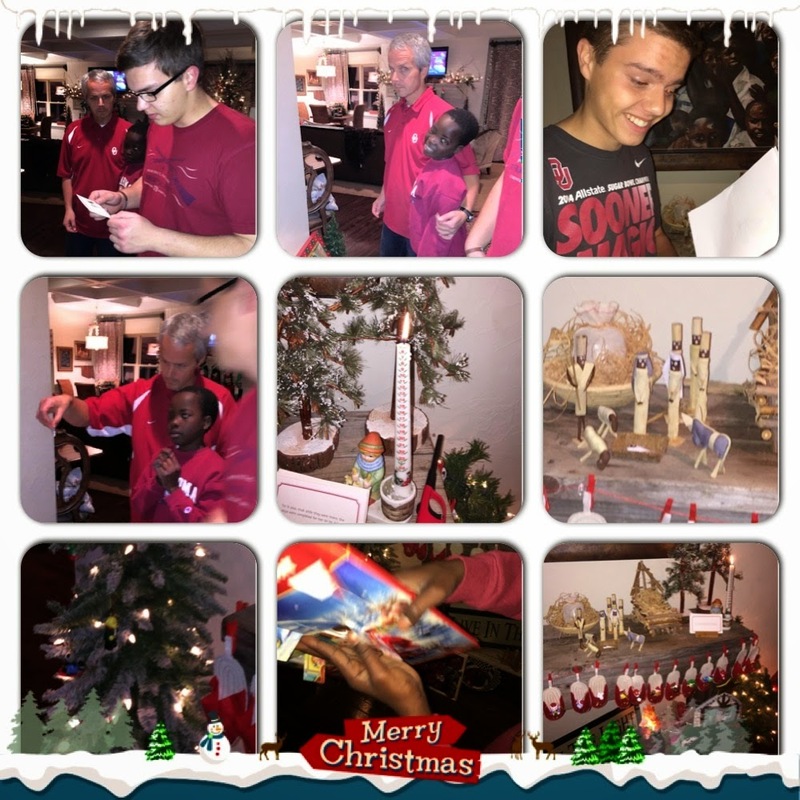 Over the years, we started Christmas traditions with our children as each came along beginning the first of December. 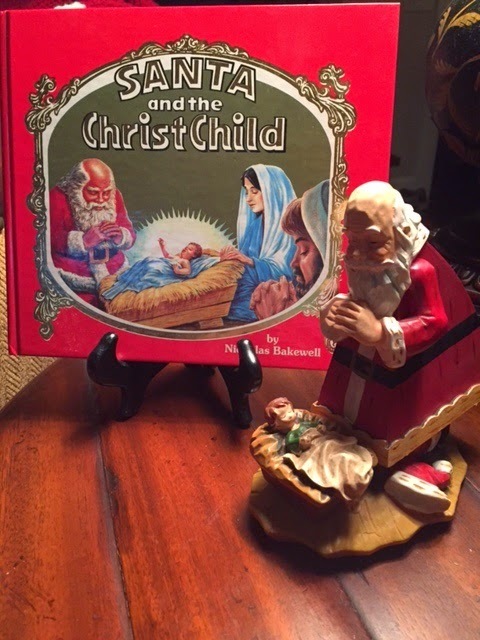 We count down and learn about and celebrate the birth of Jesus. We still had Santa as a tradition as well. 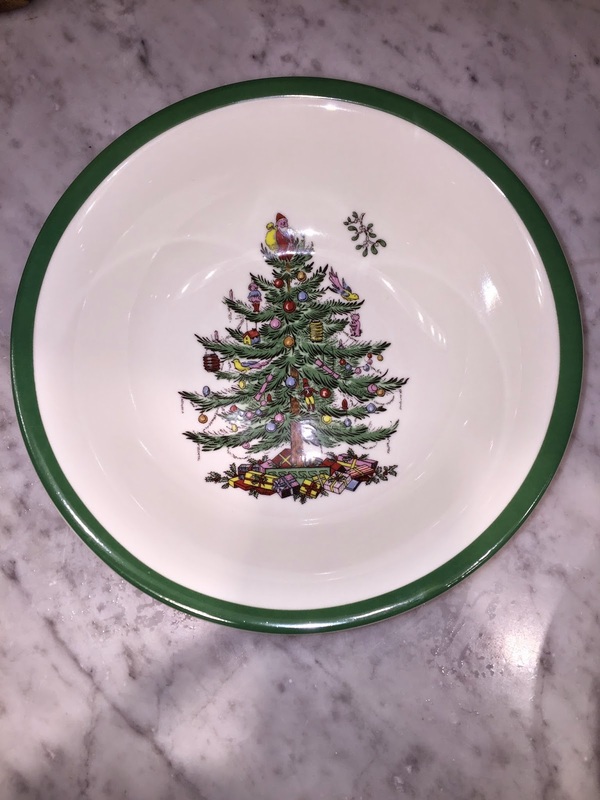 Jay’s Aunt Marsha started many traditions 6 years earlier by always giving us an ornament and Spode Christmas Dishes. The biggest tradition, that magnified itself this year, was when you joined the family, she made you a personalized needlepoint stocking. When Silas married Bethany is 2012, Marsha officially retired from needlepoint stocking making. 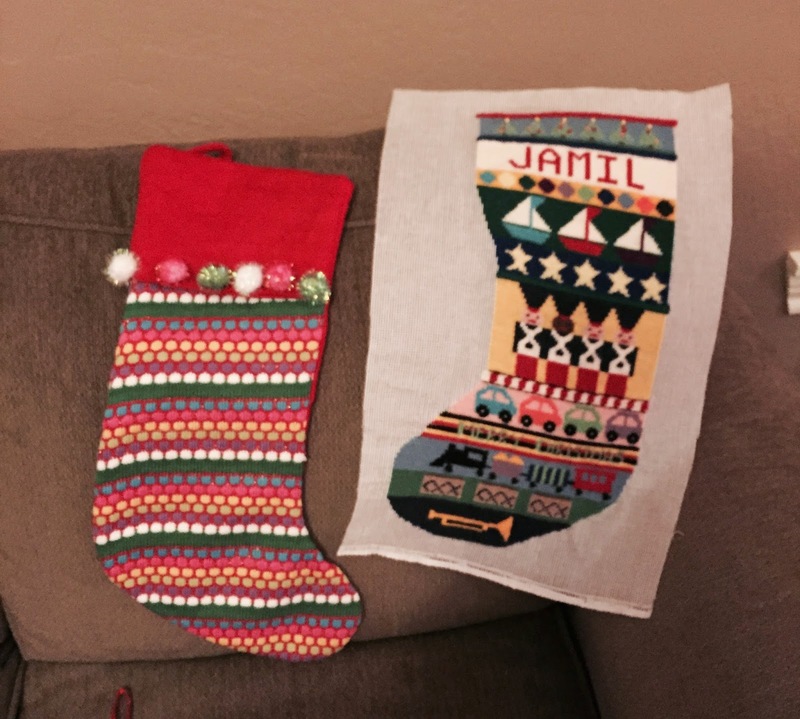 I had hoped she might come out of retirement, so Jamil would have a needlepoint stocking like ours and everyone else, since 1974, in the original DUE family. 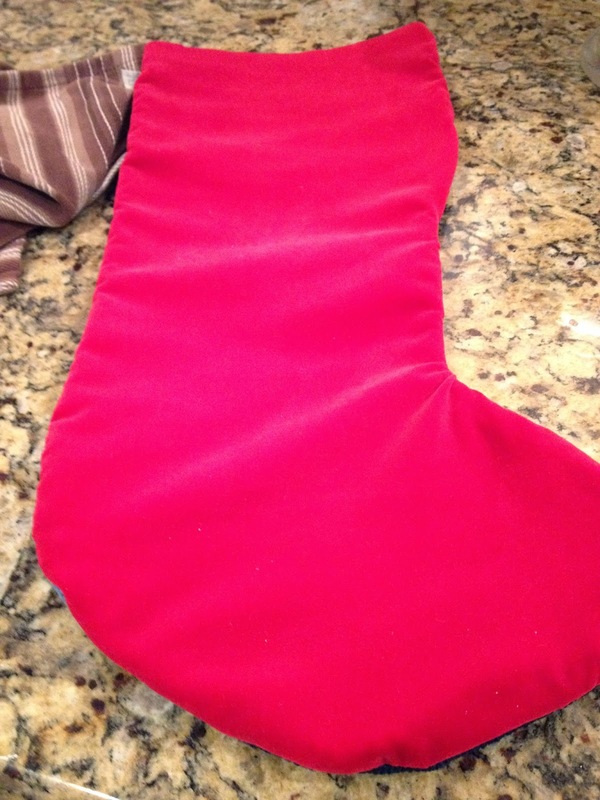 This stocking is the closest thing I could find. 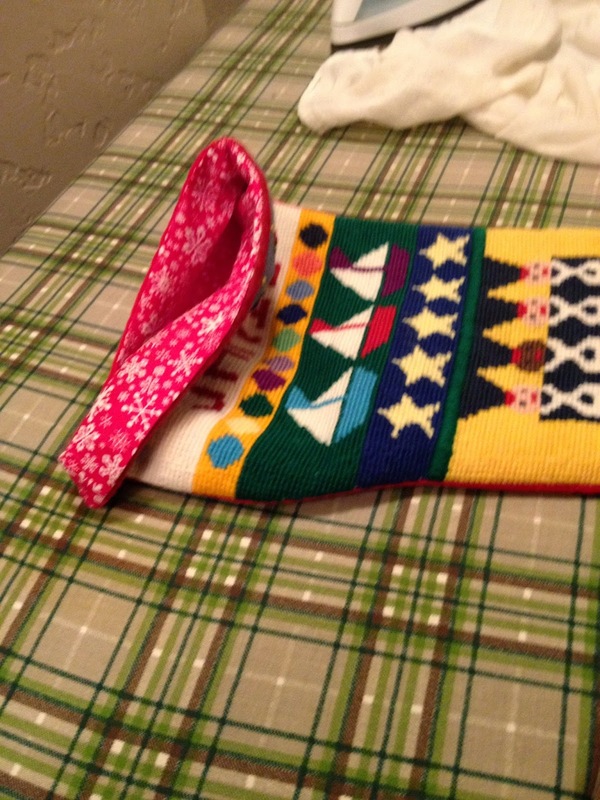 My mom had a stocking crocheted for our family members as well. 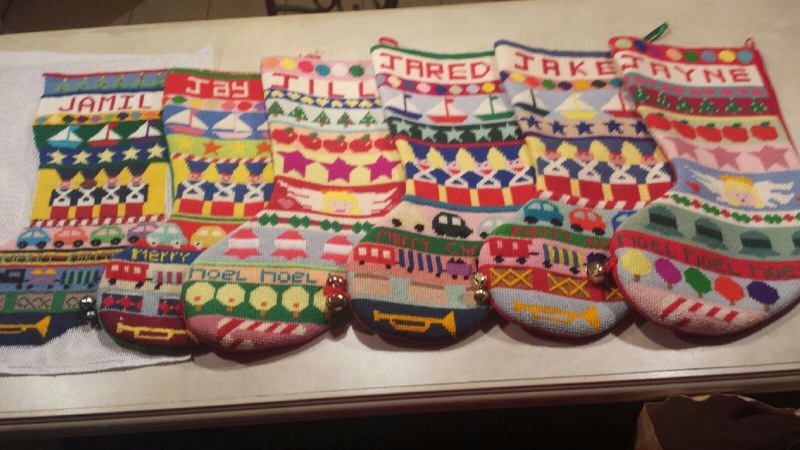 They are all different personalized Santa stockings made by Ann Hazlebaker. We love these too! 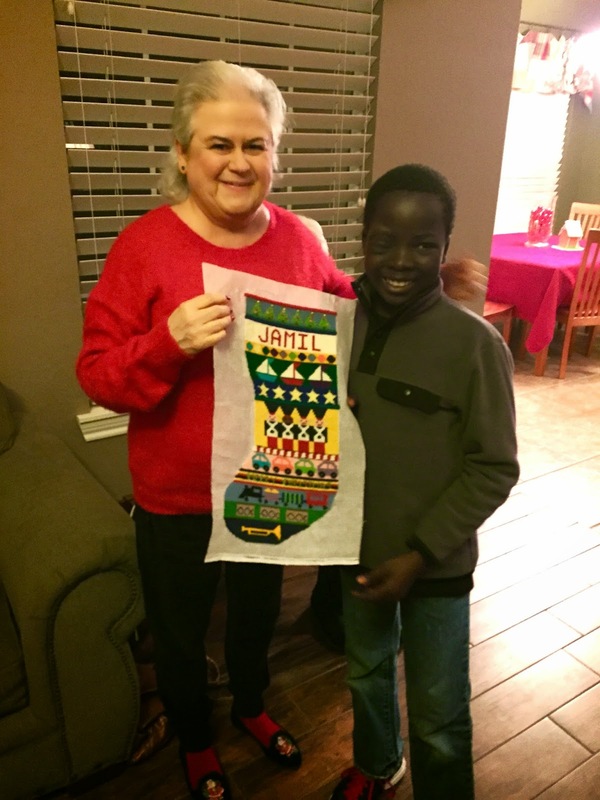 Ann was able to make Jamil one that we received right after Thanksgiving. By the way, with the addition of Jamil to our family, we now realized why we felt such conviction to homeschool Jared and Jayne. On December 2nd, I finally decided to post a plea for anyone who could or knew someone who could needlepoint. Lisa Lawrence has been such a blessing to me and our family as we have been homeschooling Jamil. I will never forget a telephone conversation with her. She said, “I want to be part of his village here.” I do not have words to express the encouragement she has provided me on this journey of homeschooling since we have so many variables with cultural, language and medical issues. One might think this is where a small Miracle occurred. 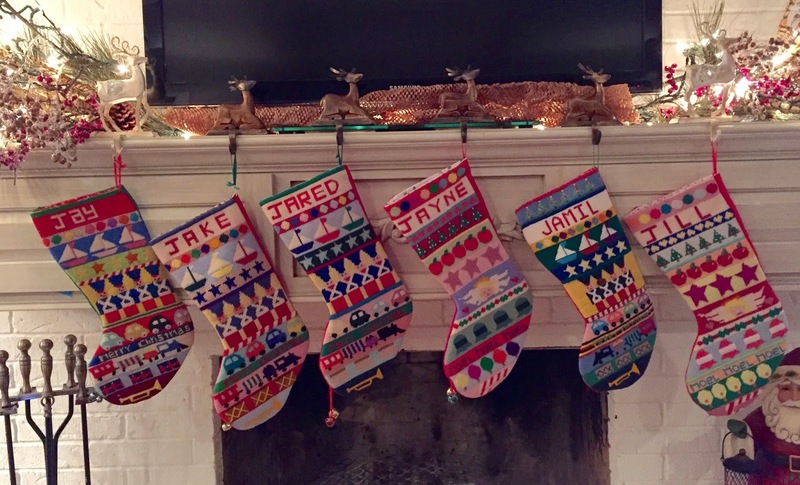 But for me, those of us girls with needlepoint stockings in the Due family, Marsha and anyone who knows anything about needlepoint realizes how big of a Miracle has occurred over the last couple of weeks. Lisa, answered my plea for needlepointing the stocking. So, on the third of December, I went to Hobby Lobby to get the canvas and thread we’d need. Jeanne had gotten a pattern together to follow. Hobby Lobby had the canvas, but the lady explained to me they did not carry the wool yarn. She sent me to a cross stitch store in south OKC. The kind lady there, explained that there was only one store, in the State of Oklahoma, that carried what I needed and it was in Tulsa. So, off to Tulsa I went. Jay was working in the ER, and as far as the kids knew I was making a quick trip to Norman. No one knew of my quick decision to head to Tulsa. So I called Jay’s sister, Jana, so at least one person would know where I was. When, I arrived at the store the two ladies helped me pick out the yarn as quickly as we could. 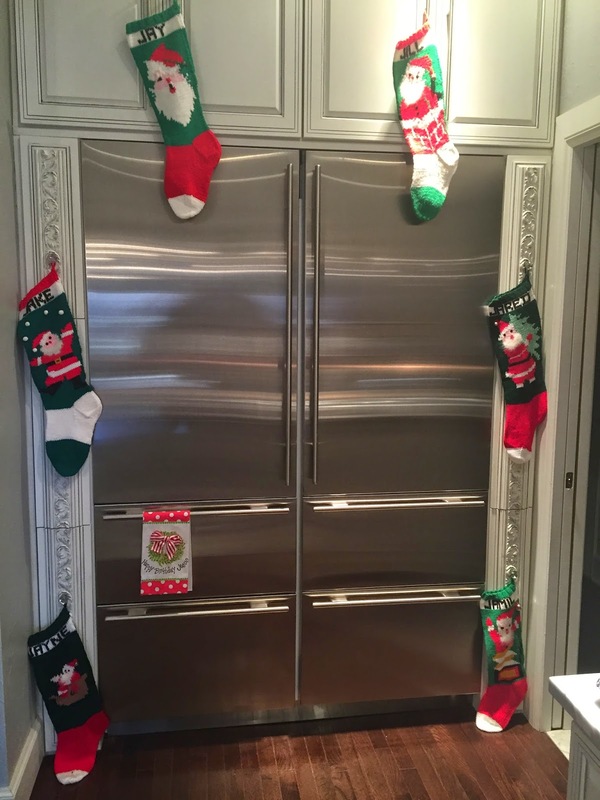 However, they let me know there is NO Way this could be accomplished, after looking at the other stockings I had brought with me, before Christmas. Lisa shared with me that a friend of hers believed it wouldn’t be possible either. Never Say Never! and Tana sewed it all together Friday. 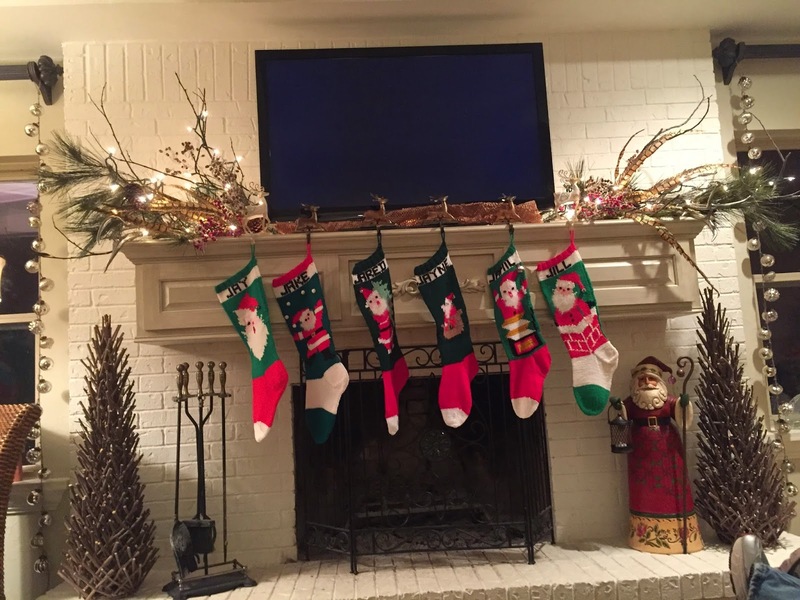 So, today, as soon as I receive Jamil’s stocking, I will move the stockings I grew up with from the mantle back to their original home in the kitchen and hang the Miracle Stocking, along with ours, on the mantle in their normal place as Christmas approaches. This small Miralcle to some, BIG to others and me, is one of the most special things that has made this Christmas Season! 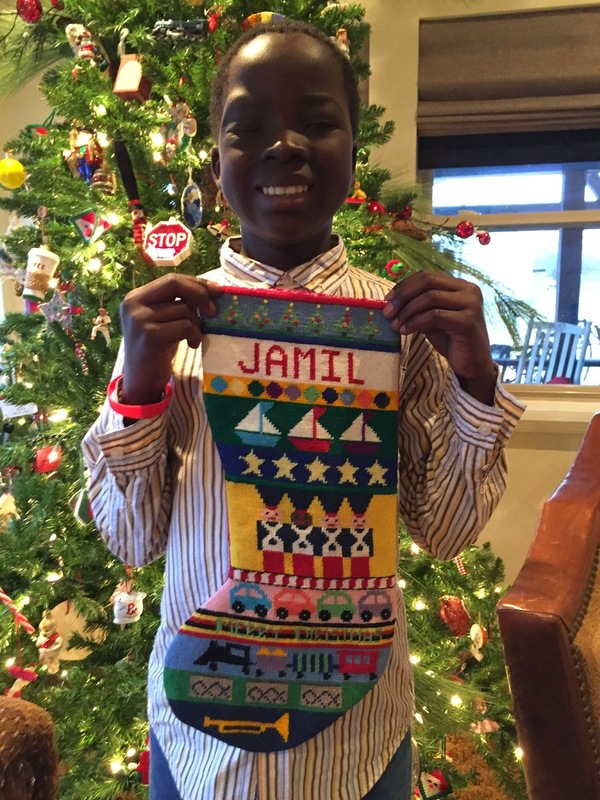 Jamil, on his first Christmas here as a member of our family, has both of our family stockings of his own. 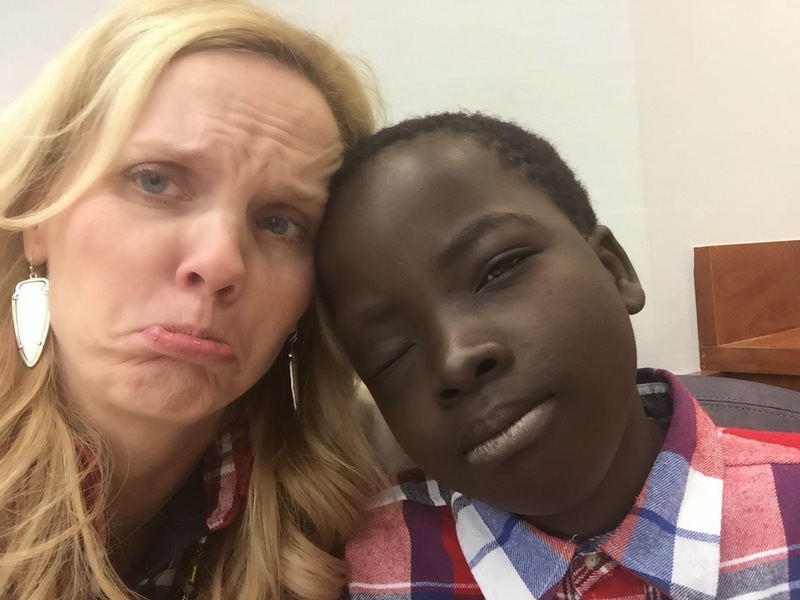 It is exciting being a new mom for the fourth time, but this time seeing things for the first time through a thirteen year old son from Uganda. Now that the stocking has found its home on the mantle, we can continue our Christmas celebration. We celebrate Christmas because of what began in the manger over 2000 years ago. Thankfully, it didn't end in the manger, but on the cross where Jesus declared "It is finished." Then to the empty tomb! 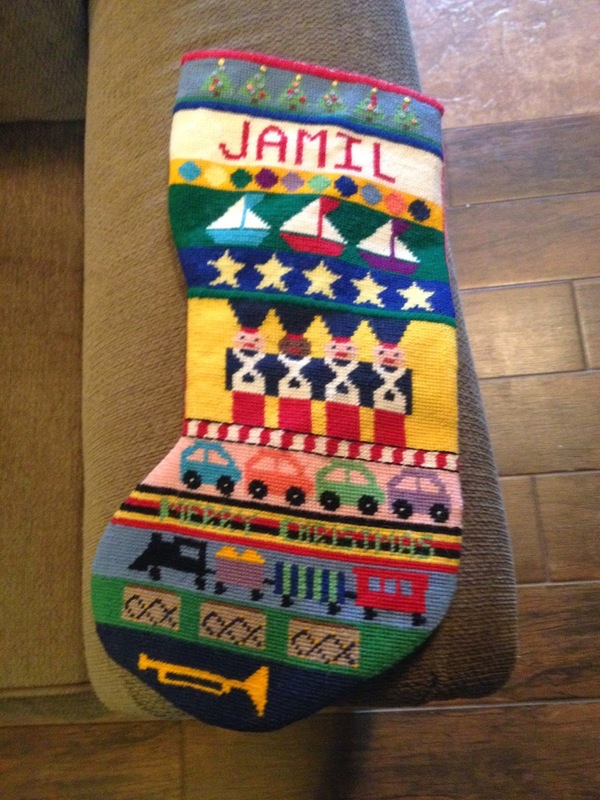 Jamil's stocking is here in time for Christmas with us. It is finished and hanging, and for now it is as empty as the tomb of Jesus! I realized Thanksgiving weekend was the third anniversary of my first blog. And to no surprise and gratefully I might add, Jay has become our resident blogger. However, I have a couple building up inside me. Today, I will share one. Jamil and I were blessed to spend the day together. It was a day filled with unanticipated painful immunizations. As we left the ranch this morning, we were expecting the TB test to be checked and a physical exam for our immigration status to move forward to the next stage. 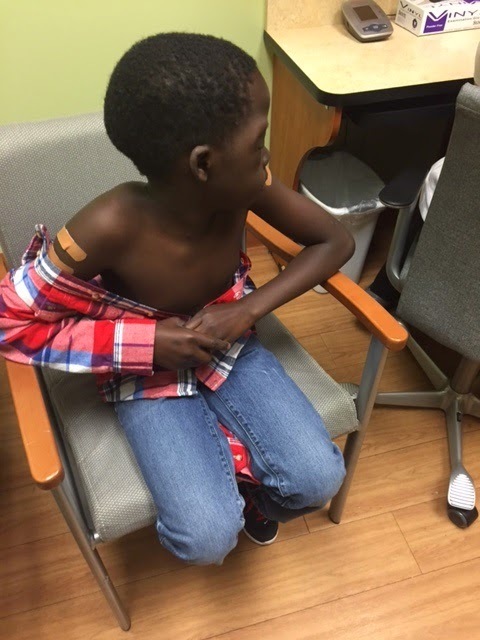 However, the nurse let us know she could not do the exam until he had his Hep A, Hep B, Meningococcal, and flu vaccinations. So, we were given directions to the Cleveland County Health Department. The nurse told us to come back at 1:30pm and she would work us back in for the exam. (Dilemma: North Pole City had been gracious enough to make an appointment at 1:30 today for Jamil to see and meet Santa. They do this for special situations.) I told the nurse, but I would change the Santa pictures. She was so sweet. She recommended that we go ahead and go to North Pole City and then to come back to the clinic when we were finished. So, off to the health department we went. The staff was friendly and we were called back within 15 minutes. One problem: They were out of the menningococcal vaccine. So as Jamil was getting his 3 somewhat painful injections, I was on the phone to our pediatrician’s office in Edmond. Of course, it was his half day and I’m calling at 11:45am. The sweet triage nurse said she would check with the doctor on call and get back with me at 1pm. (Did I mention the Santa pictures?) The nurse at the Health Department said that sometimes a pharmacy will have this vaccine, but I should call to check first. Yeah, for the Walgreens in Norman on Main! They had it! Only downfall, they don’t accept our insurance so I got to pay a pretty penny for this fourth painful shot!! I called off our pediatrician’s office and off to Wendy’s we went for a hamburger and Frosty! (The smallest Frosty I’ve ever seen. However, they did give Jamil two!) He enjoyed both. We were now on our way to North Pole City to see Santa. I had called Meredith Crowder to see if we might stop by Newcastle on the way back to the ranch to meet the girls. I told her we were going to North Pole City at 1:30. She said they had talked about going there today too. With all of our unforeseen detours, I hadn’t talked to her again. The very kind lady who had set our appointment was at Santa’s Spot and said we’d be next. 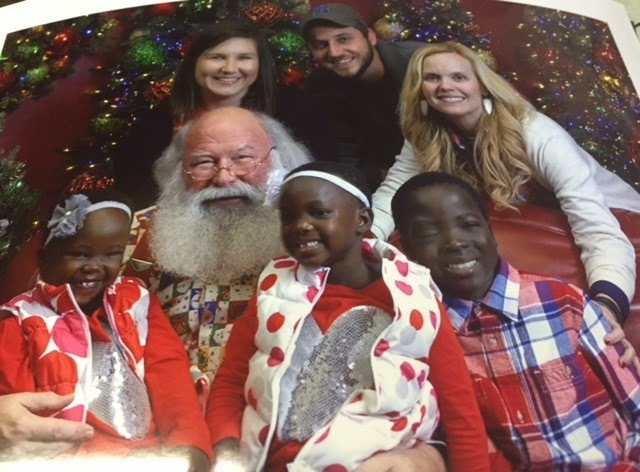 This sweet Santa takes time with each child or children. He gets to know them before a single picture is snapped. I was impressed. 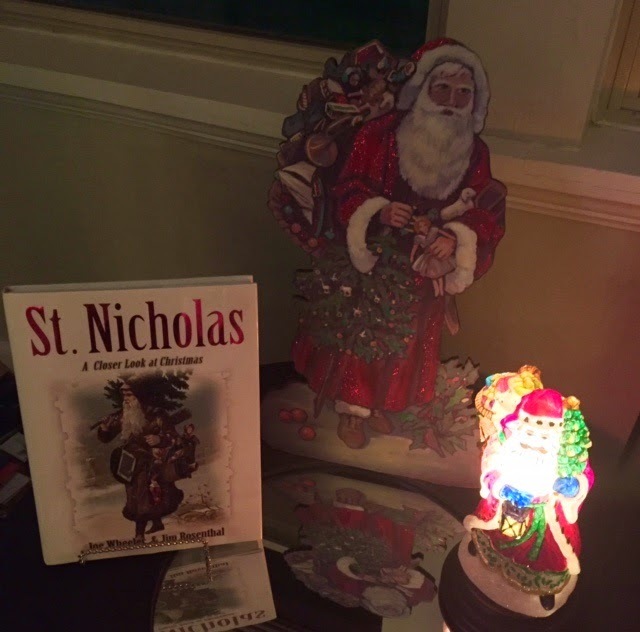 As our children have gotten older, we have explained to them about the true Santa Claus, St. Nicholas, when the time came as they matured. We decided to explain this to Jamil since he is thirteen. We’ve told him about how in the United States Christmas can be more about Santa (who is known to live at the North Pole and fly around the world in a sleigh with reindeer), than the birth of Jesus. First, Santa, realizing Jamil was 13 was giving him some wisdom about working hard and saving money for a car because 16 isn’t too far away. He asked Jamil what he would like for him to bring him for Christmas. 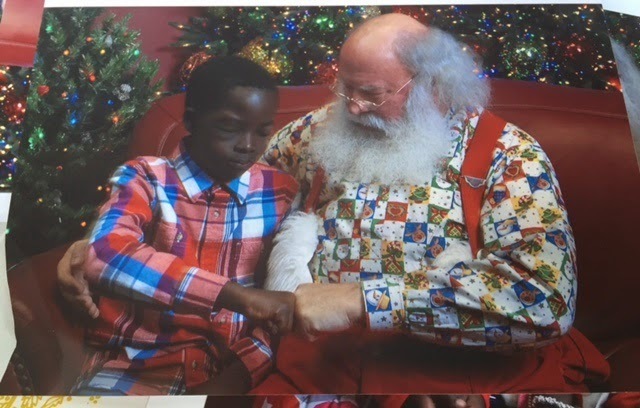 This sweet Santa, after learning Jamil was from Uganda(where a good Christmas was enough families having the finances to pool together to have meat at their Christmas meal) and this was his first Christmas season in the United States, eloquently explained the story of St. Nicholas. Santa noted that St. Nicholas was a young boy whose parents died from a plague and was adopted by some religious men, monks, in Turkey. He also pointed out that Turkey is a country not too far from Uganda. He then explained how the monks owned an inn with stables and worked hard. Nicholas took over the business and found himself with more wealth than he needed. He saw others in his village in need. So, he began giving gifts at Christmas anonymously. He did not want any credit for this good deed from man. Santa went on to explain that sometimes, because here in the US there is so much “to do” about Christmas, often its true meaning is lost for many. Christmas is truly about the birth of Jesus. Also, the first gifts were special gifts given to Jesus by the wisemen. Santa asked me about Jamil’s medical condition. After I gave him a quick version, he asked Jamil if it would be alright with him if we prayed together and he place his hand on Jamil’s head. Jamil said, “Yes.” As the prayer ended, I heard Meredith call my name. So, we got to meet the girls, and get a few more pictures with Santa. Jamil was able to speak to the Crowder girls in Luganda. 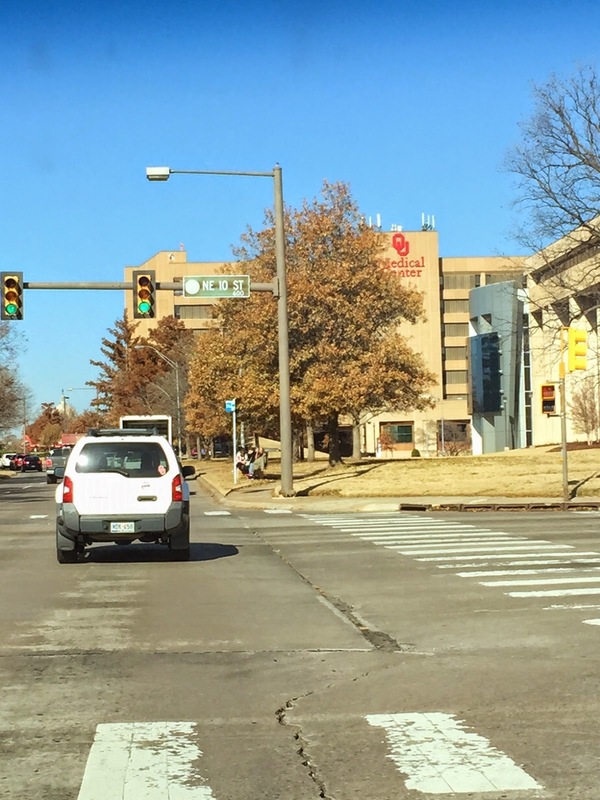 We headed back to the clinic in Norman and finished the exam. The results of this exam are the next step in our legal process with Jamil. We can now officially apply for his permanent residency. On the way home, Jamil asked me if I had Santa’s number. I think he realized he forgot to tell him what he wanted for Christmas. I told him we could send him a letter. A little later down the road ,Jamil and I talked about how we are not promised a life without detours and pain. But, there are some really precious moments in the midst of it as well. The most important is the Presence of the Lord through it all. A Glimpse of Things Unseen, is a book worth your time to read, by Mark Buchanan. I’m not finished with it yet, but the Lord has used it as I have been struggling as I see a young boy switching cultures. Switching from a culture of contentment, respectfulness, colorblindness, yet intense poverty in Uganda to one of discontentment, materialism, and racial tensions here. This biblical book reminded me God has put in us the reason we are never truly satisfied because this is not our home. I pray, Lord let me choose to let Your light shine through me as I pass through this temporary place of bitter-sweetness, to my true home. For each of us, there is an opportunity, which was given to us to choose over 2000 years ago, beginning in a manger in Bethlehem. Proverbs 3:5-6 "Trust in the Lord, with all your heart and lean not on your own understanding. But in all your ways acknowledge Him and He will make your paths straight." We have completed a full day of medical exams for Jamil. We have been blessed by what we consider great news. Our day started in Norman. 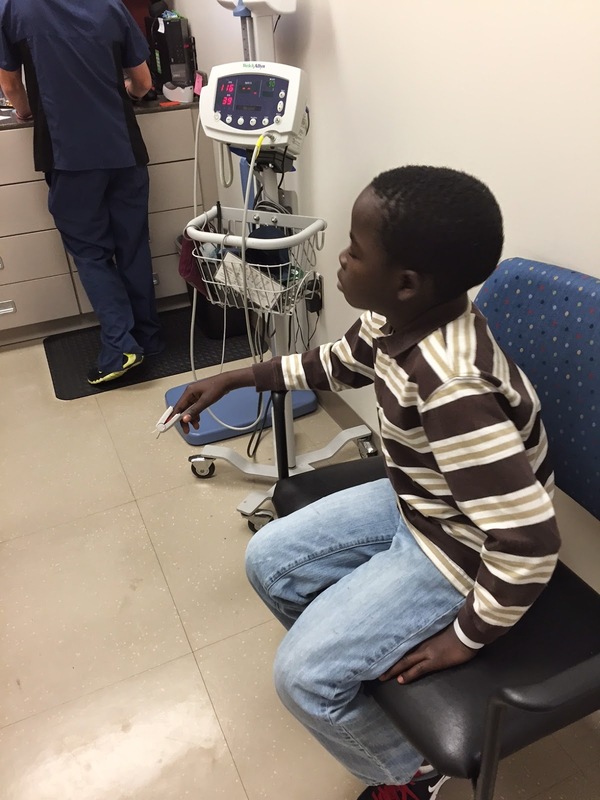 Jamil had the first phase of an Immigration Physical Exam. This is a medical exam performed as directed by the US immigration department. They do these to insure that the applicant does not have some communicable disease, such as Tb. He will undergo the final section of the exam on Wednesday. Once we have this done, we can instruct our attorney to file the paperwork for the permanent residency (green card). These two exams were supposed to be Tuesday and Thursday. This morning, however, the doctor’s office called us to see if we could move it up a day. Since his OU appointment was not until 2:00, we were able to make this switch. 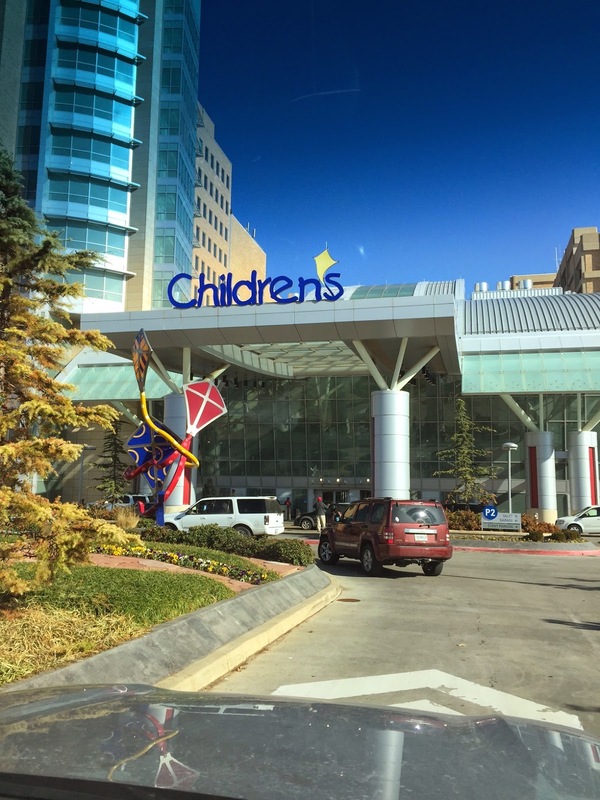 After eating some lunch, we drove up to OU Children’s hospital in Oklahoma City. 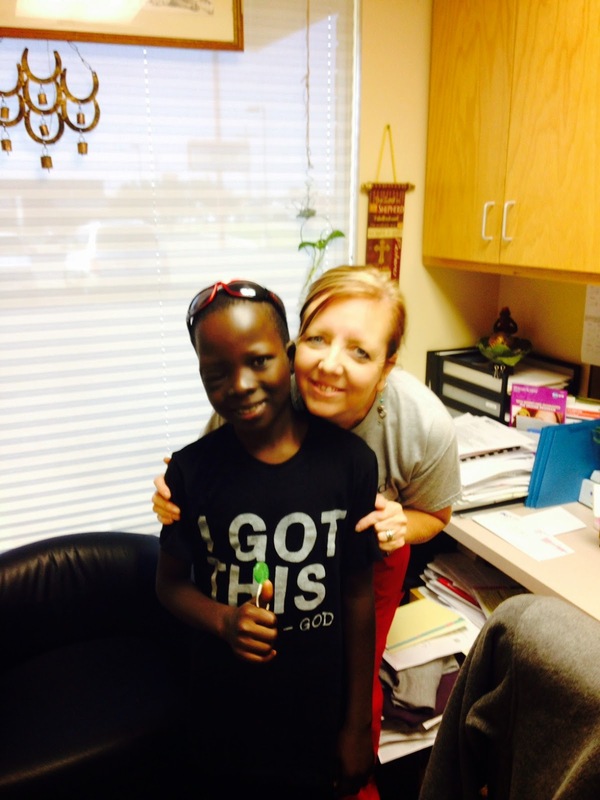 It is hard to believe that Oklahoma has a clinic specially designed for Neurofibromatosis type 2 (NF2). We were in that incredible clinic today. we were taken back for triage and vitals. Jamil has grown one inch in height and 8lbs in weight since his visit to OU 3 months ago. Our first exam was with the Neurologist and Neurosurgeon. They were in the room at the same time. They gave us the results of the MRIs that Jamil had done last Monday. His eye/brain tumor had not changed in size or progressed!! His spine was clear of problems, from the top of this neck to the bottom of his back. The radiologists noted a very small nodule in the lining of his lung. They think that this could be a small fibroma that goes with NF2. This is something that we will just watch for now and probably rescan in 1 year, unless problems arise. After the two neuro doctors had completed a normal neuro/physical exam, we were able to ask them many questions. They explained to us that every patient with NF2 responds differently. Because of this, it is hard to predict the course of the disease. The average life expectancy for an NF2 patient is mid-30’s. There are some promising treatments for NF2 on the horizon. According the neurosurgeon, there are some surgical options for Jamil. If the need arises, we can discuss those at that time. The NF2 doctors encourage their patients to live like any other kid their age, as much as possible. Soon after these 2 doctors left the room, a pediatric endocrinologist entered. He too examined Jamil and found no reason for concern. 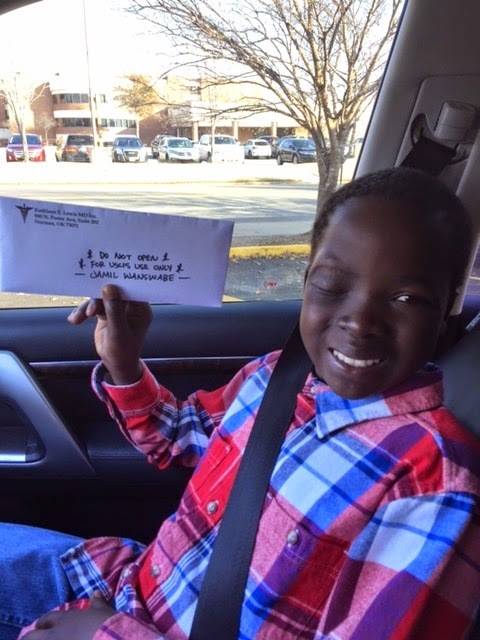 Because Jamil had radiation to his eye, there is some concern that the pituitary gland could have been injured. So far, Jamil has no evidence of hormone/pituitary problems. This doctor ordered several blood tests to make sure that all of his hormones are in the right levels. He also is checking a vitamin D level. 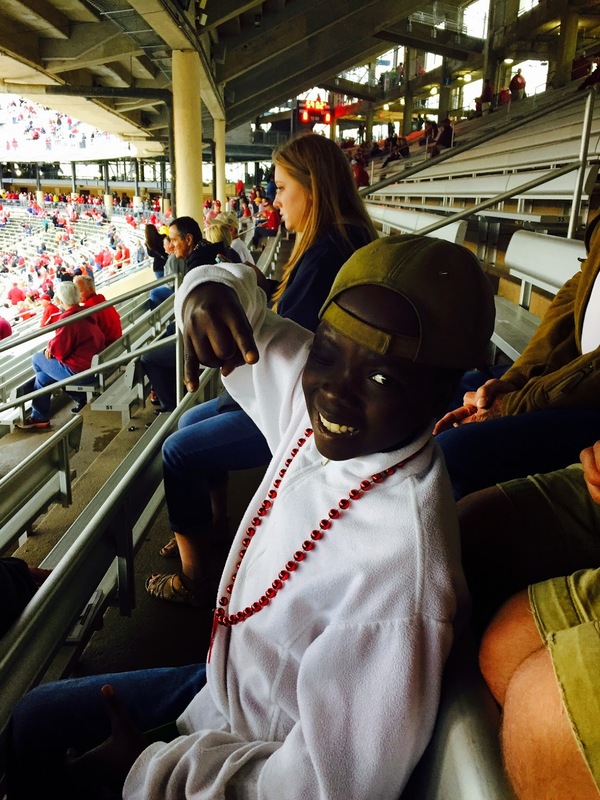 Given the lower sun intensity in Oklahoma (compared to Uganda) and Jamil’s dark skin, we may need to supplement his vitamin D to keep his bones strong. The last round of doctors included the hematology/oncology team. We discussed the MRIs a little more and talked about timing of follow up. They recommended a 6 month follow up. We eventually settled on May (5 months) because we wanted to leave a summer Uganda trip as an option if the immigration status is settled. Prior to that follow up in May, Jamil will get an MRI of his head to monitor the current tumor. I feel quite confident that prayer has kept the tumor from growing. Jamil and our family have been covered in a tsunami of prayer and we can feel them. Thank you so much for this dedication in petitioning the true healer. Please continue to keep Jamil in your prayers. As stated before, we have the second step of his Immigration exam on Wednesday. If that turns out like we expect, we will then be waiting on the legal immigration resolution. As we have just passed through the Thanksgiving holiday and head into Christmas, I am indeed thankful. 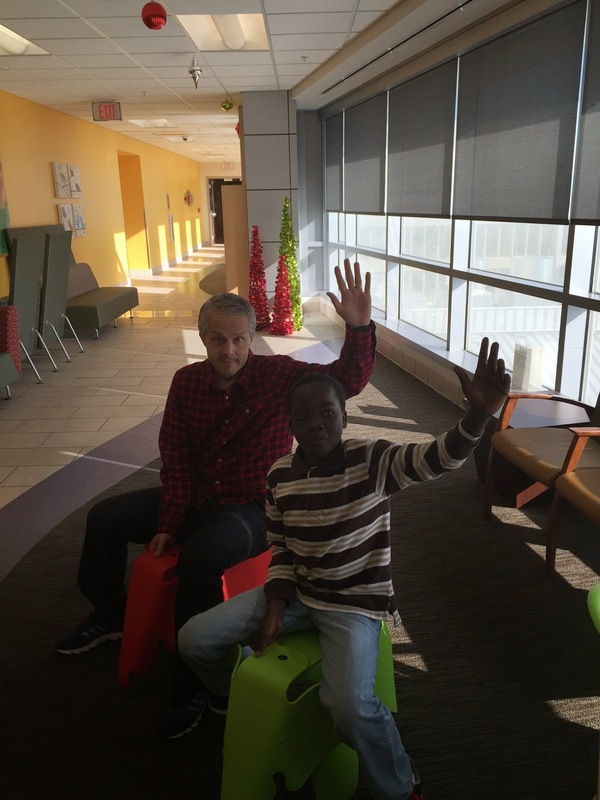 I am thankful that God allowed us to be able to bring Jamil to the USA. Many things were stacked against us, but God found a way. I am thankful that we have connected with uniquely qualified doctors and that we now have a firm diagnosis of what Jamil, and those of us that love him, are up against. Jamil’s oncologist, at OU, had a sister with exactly the same medical diagnosis as Jamil. She is quite acquainted with Neurofibromatosis type II and any new advances in treating the problems associated with it. There is actually a special clinic, just for NF2 patients, at OU. I am thankful for the plethora of good times that Jamil has been able to experience over the past 3 months. Many first time experiences for a young man that seems to take them in stride and not be too overwhelmed by anything. He is always willing to try anything at least once. I am thankful for the good health that has allowed him to enjoy the new experiences of the past 3 months. He has not had a nosebleed since we landed in the USA. He has rarely had a headache. Both of these seemed to be semi-frequent problems while we were still in Uganda. I am thankful that God has pointed us to the precise legal team that we need to navigate the immigration system. One attorney based out of OKC and one based out of Washington DC. Update on this is found below. I am thankful for the family and friends that have showered Jamil with love and prayers over the past two and a half years, but especially over the past 6 months. We showed him, today, the number of people on facebook that said that they were praying for his MRIs and he was astonished. At the same time that I am so thankful, I am also quite confident. I am confident that we serve an awesome God that is still in the business of doing miracles. 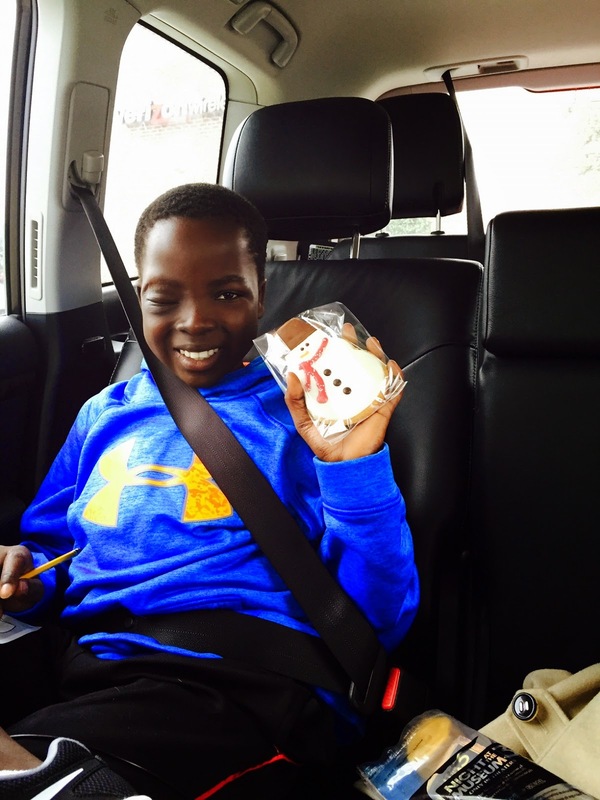 Jamil needs a miracle and that is exactly what we are believing our God for. 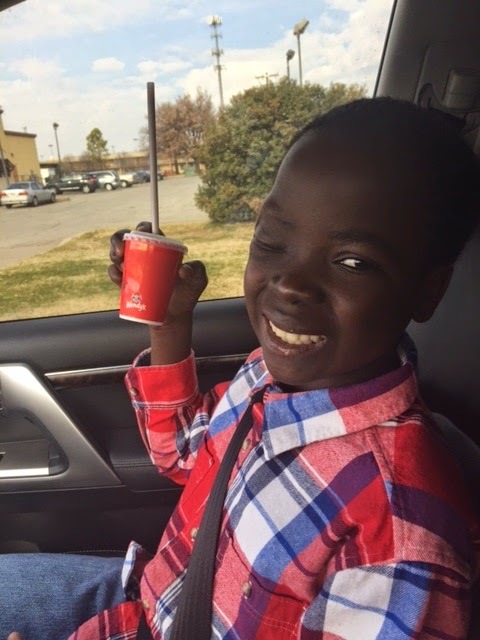 As many of you know, our last medical update, in September, showed that Jamil’s tumor had progressed from his eye socket, back through his skull and into the cavernous sinus, a big blood vessel on the bottom side of his brain. At this point, we have not been advised of any surgical solution to remove the tumor from his brain. Intracranial meningiomas can sometimes be treated with a special radiation called gamma knife. Jamil may not be a candidate for this as he already had some form of radiation in Uganda. Jamil’s doctor says that there are some promising trials for a chemotherapy for this problem on the horizon, but as of now, there are no chemotherapy options. Jamil’s prognosis and projected longevity are based on how fast the tumor grows. We will hopefully know more about the tumor’s pace when we have his next appointment on December 8th. I am confident that even if the plan that unfolds is not what I would choose, God is in control and has a plan for how it all works out. I am confident that God will give Jamil, and those of us who love him, the courage to face what the road ahead might look like and the grace to accept it. I am confident that God will direct our legal team in the best way to keep Jamil in the USA, in front of the best doctors, and with access to the healthcare that he needs. I am confident that our many friends and supporters of Due Unto Others will continue to petition God on Jamil’s behalf. Thank you. So that all of you are up to speed, here is the timeline and plan as we know it today. December 1st we are getting 4 MRI scans. The first is a repeat scan of his head to determine if the meningioma has regressed, stayed the same, or expanded. This information will help us know a more long term plan. The other three MRIs will be to screen his neck and back to make sure that no other tumors or problems have developed there, as can be a problem with NF2. December 2nd we have a court date in Stephens County Court to petition for legal custody, in the USA, of Jamil. 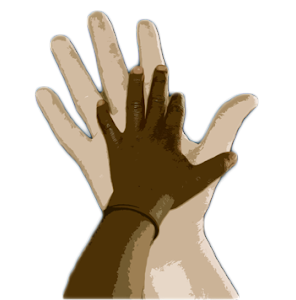 We have custody from a Ugandan Court, but we need legal custody here to move forward. If this custody is granted, we will then apply for him a juvenile green card. This is for abandoned or neglected minors from other countries. This is similar to what many of the children from Central America were coming here on, earlier this past summer. This is done through the state department and if granted, would allow Jamil to be in the USA for 10 years. This 10 year green card, combined with his 10 year Ugandan Passport, would allow him to travel anywhere in the world and then be allowed to come back “Home” to the USA. We are unsure how long these two steps might take as the number of applications for this juvenile green card have risen sharply over the past couple of years. He has be adopted in our hearts and minds but not legally at this point. 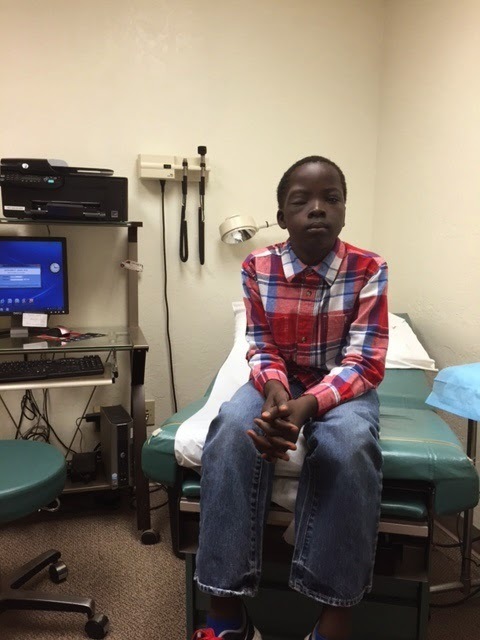 We will base the need for the legal step of adoption on how his medical reports are looking. On December 8th, we have an appointment in the NF2 clinic at OU. Jamil will see his primary oncologist and we will be able to discuss the MRI reports and what the tumor is doing. He will also see a neurologist, endocrinologist and I think an Ophthalmologist that day. We will be able to discuss any problems that Jamil may have in those specialties because of his NF2. We will be posting updates after each of these important dates. In the meantime, Jamil has been doing well with his school work. He has gone through a full year of math work in one semester. He is working diligently on his reading and English studies. Please continue your prayers for Jamil. We can feel them daily.